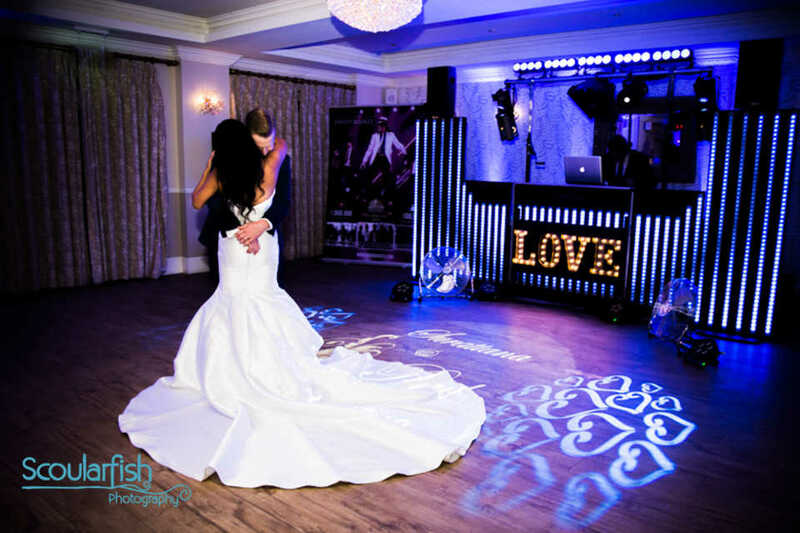 Beaulieu Hotel Wedding DJ & Disco – Amazing Weddings! 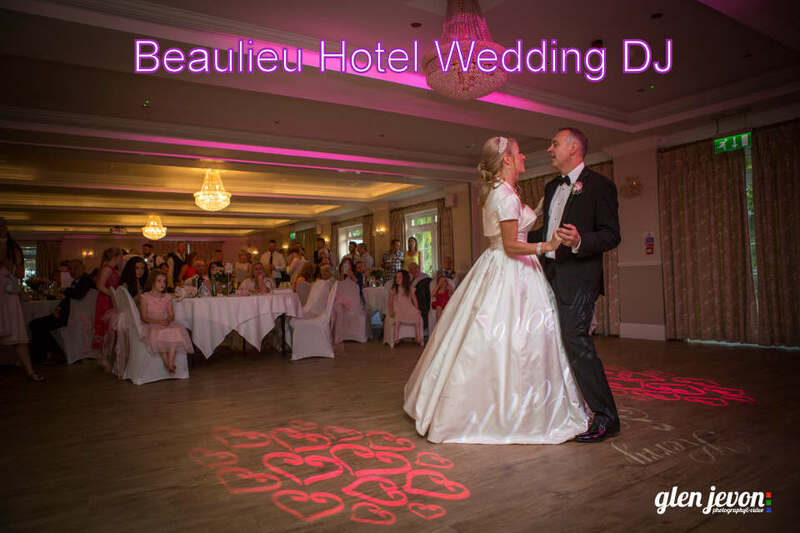 I am one of Hampshire’s premier wedding DJ’s and am very proud to be a recommended Wedding DJ for the Beaulieu Hotel, a lovely hotel in the heart of the New Forest. 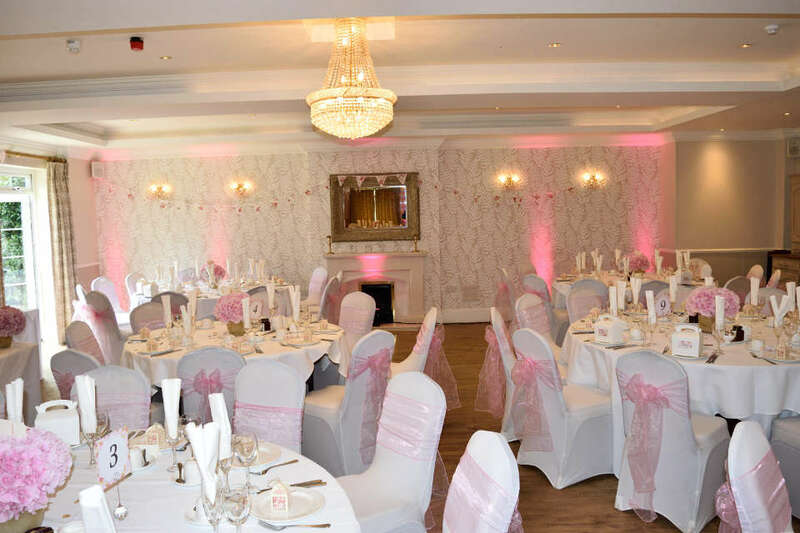 The Beaulieu Hotel is one of the top wedding venues in the New Forest with one of the largest function rooms… the beautifully decorated Beaulieu Suite. Freya and Sophie and their dedicated team make the room look stunning with their fine attention to detail. They ensure that you have the perfect day seamlessly transforming the room between the romantic ceremony into the elegantly laid up wedding breakfast and then into the evening reception ready for the big party. 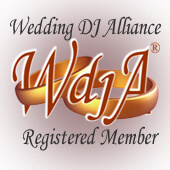 I am a highly recommended DJ with a premium quality disco who has performed at more than 1000 amazing weddings. I will be able to provide the exact look or package that you want for your wedding… you may choose just an evening disco from a selection of my stylish new modern shows or decide to have one of my very popular “All Day Wedding Packages” which makes the whole day run smoothly. Whatever you decide I will work with you to make sure that your wedding is truly Amazing! 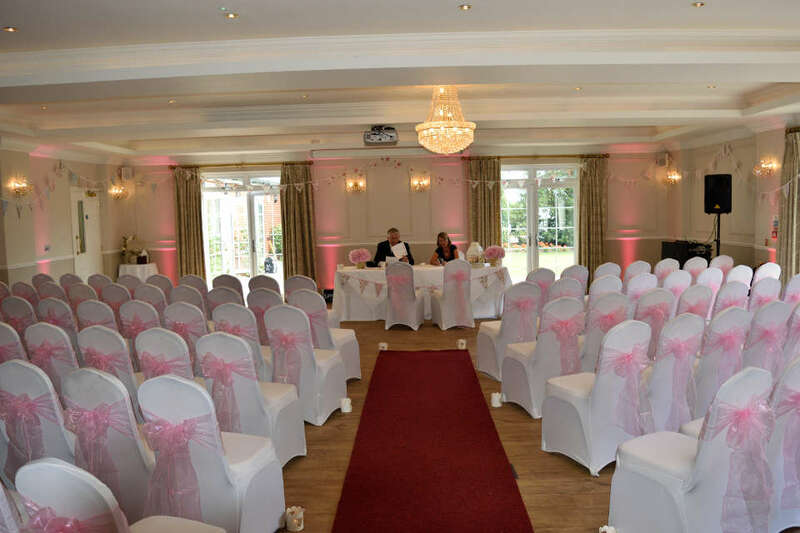 The All Day Wedding Package is a popular option which makes your whole day run smoothly and makes your reception look beautiful. 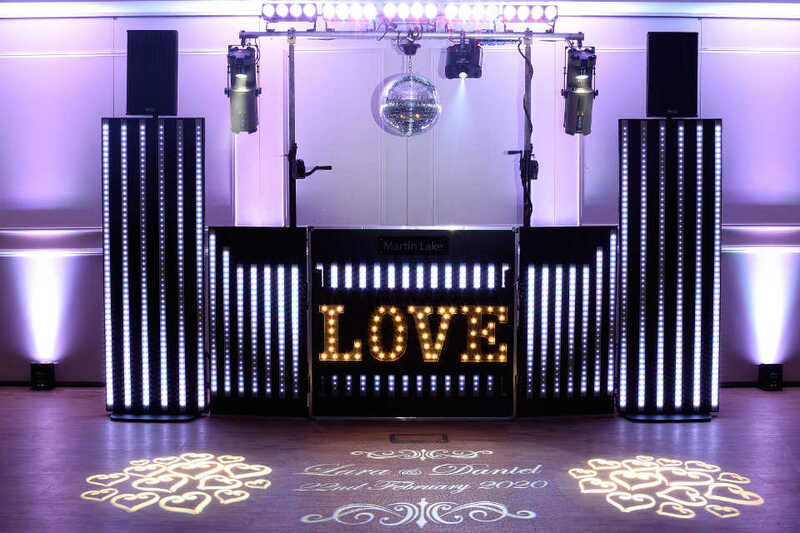 You have music throughout the day for your drinks reception and your wedding breakfast, a microphone for the speeches, a DJ to make important announcements, uplighting to match your colour scheme to make your reception look beautiful and the “Platinum Show” for a brilliant evening disco for up to 5 hours. 8 uplighters are set up in your evening reception room which may also be your wedding breakfast room. They are set to your colours for the day and your first dance and then flash in time to the music when the dancing starts. • Background music for a drinks reception played through a battery powered speaker which can be used in the gardens during your photographs. • Any special announcements during the day. I make important announcements on a discrete sound system in your wedding breakfast room during the day. It can be used to give you a grand entrance into the room to music for your wedding breakfast, introducing the speeches and making special announcements like cutting the cake. • The high quality “Platinum Show” for a brilliant evening disco for up to 5 hours..
• Ongoing email support to answer any questions for peace of mind. You can upgrade to the “Premium All Day Wedding Package” which includes everything in the Wedding Package but upgrades the disco from the “Platinum Show” to the personalised impressive “Wedding Show” disco. All of the above with an upgrade to the “Wedding Show” disco with more lighting, uplighting, and special personalised wedding design touches. Here is a video and some pictures of Emma and Tom’s excellent wedding. They hired one of my “All Day Wedding Packages” and added on “Music for the Ceremony” and a Laser to the evening disco. I set the uplighting up for the whole day programmed to Emma’s wedding colours which created a lovely backdrop for the ceremony and the wedding breakfast. Here is my perspective of Emma & Toms wedding at the Beaulieu Hotel and shows what difference hiring a quality DJ can make for your big day. I had a meeting with Emma at the hotel where we went through everything in detail, from the timings and the music to special moments happening in the evening. Emma sent me a list of music that they wanted for the day split into music for the ceremony and music for the evening reception. I organised it into the best playable order…tracks that were not so good for dancing for arrival and the buffet and the big dance and party tracks for the peak times. I downloaded any of the tracks that I did not have from itunes. Before the day itself I programmed the uplighting to complement their wedding colours. It’s a beautiful day and I drive to the venue early. I arrive at the venue and set up a discrete sound system in the corner ready for the ceremony in the Beaulieu Suite. I also arranged the uplighting around the room and set it to Emma’s Pink colour scheme. Emma had selected piano versions of modern songs for gentle background music while people were arriving. I then played the “Turning Page” instrumental from Twilight for the processional at the right volume to give this very special moment impact. Emma looked beautiful in her stunning dress! Emma & Tom have a lovely ceremony and a very happy recessional to the sounds of Michael Buble’s “All I Do Is Dream Of You” to big cheers as they walk out as husband and wife! It was a beautiful day so the champagne reception was being held in the gardens. I put a battery powered speaker outside with an ipod for a great soundtrack while the photographs were being taken which created the perfect atmosphere. Peter and the staff did an amazing job transforming the Beaulieu Suite into a stunning wedding breakfast room in record time. Once all of the guests were seated I introduced Emma & Tom into the room for a grand entrance to Bruno Mars, “Marry You”. I played background music during the wedding breakfast which created a nice atmosphere. After the lovely wedding breakfast I introduced the speeches and provided my radio microphone so that everybody could hear them. I gave a big introduction to Mr & Mrs Caplin for the first dance…there was lots of cheering from family and friends as Emma & Tom took to the floor to Kodaline’s “The One” for a very special emotional moment. 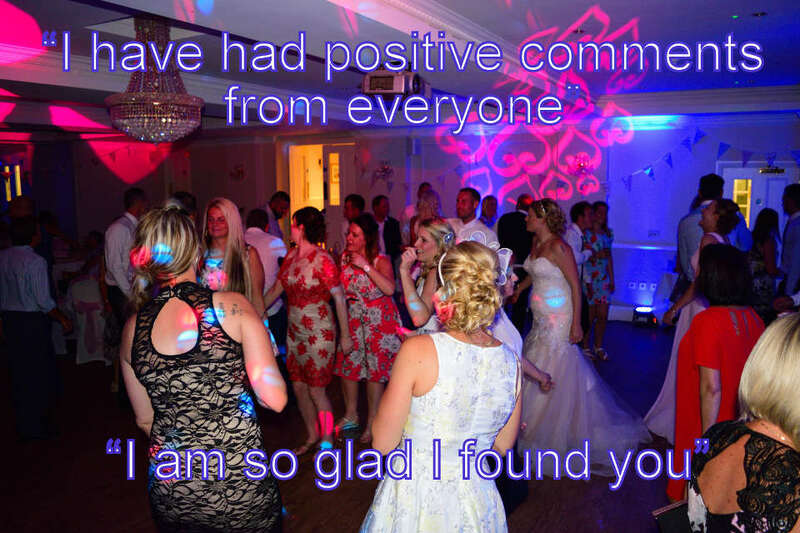 The uplighting was set to complement their colour scheme and I projected a personalised laser message on the wall over their heads behind them. The lighting made a great backdrop for the photos. 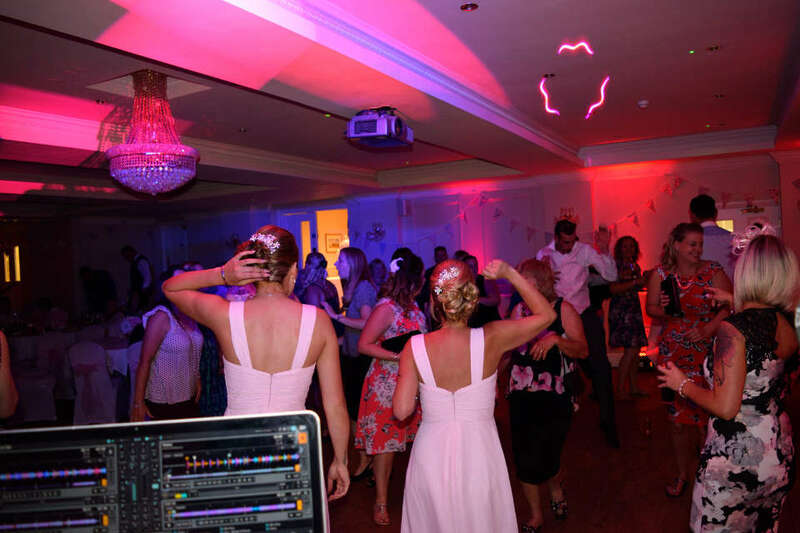 It was then non stop dancing until midnight… I mixed up Emma & Tom’s requests with other big tracks to keep a full dancefloor and party atmosphere. There were lots of charts early on with some 90’s girl and boy band, a few cheesy requests and some big singalong anthems which raised the roof. It was a great party that also included a memorable dance off. Emma and Tom were delighted with the whole day and guests were coming up to me at the end saying how much they enjoyed it. What a brilliant day! You can read a review below. We wanted to thank you for such an amazing day! Everyone I have spoken to has said how amazing the disco was. Our whole experience with you from start to finish has been personal and tailored to what we as a couple love. You didn’t just turn up and play some songs which is what I was worried about when looking for a DJ! You took the time to get to know us, listened to what we wanted and gave us advice from your experience. The whole day went perfectly, the lighting looked amazing, the music during the ceremony and the afternoon reception set a beautiful background, and I just didn’t have to worry about it. Followed by an amazing evening of which I didn’t want to leave the dance floor. I have had nothing but positive comments from everyone and I am so glad I found you! I won’t hesitate to recommend you to anyone I know. Thank you so much again for being a part of our special day. 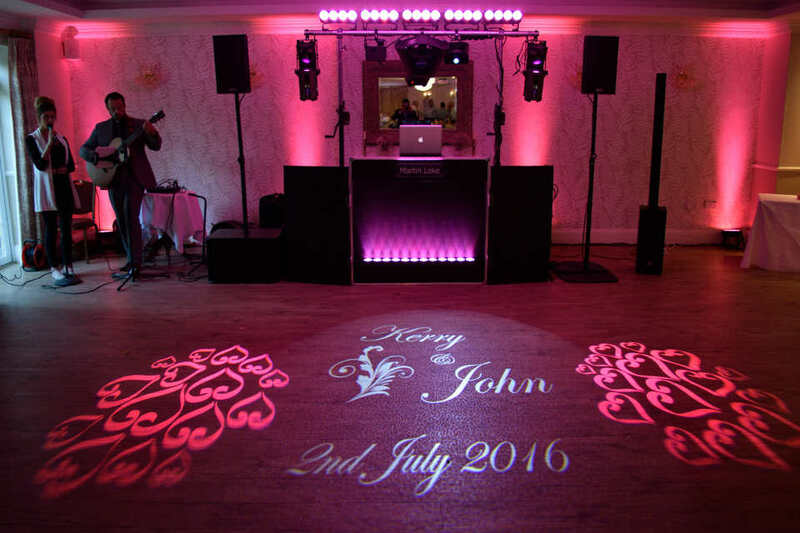 “We were so pleased that we had Martin as DJ for our Wedding evening celebration. “THANK YOU Martin for making our wedding celebration into a real dance party – we have had so many good comments from our friends & family. They loved the video that you took which showed what a great time we had. You can check the show options and prices on my Shows and Prices pages. Please do not hesitate to contact me if you have any questions or if you would like to book as the prime wedding dates get booked up fast. 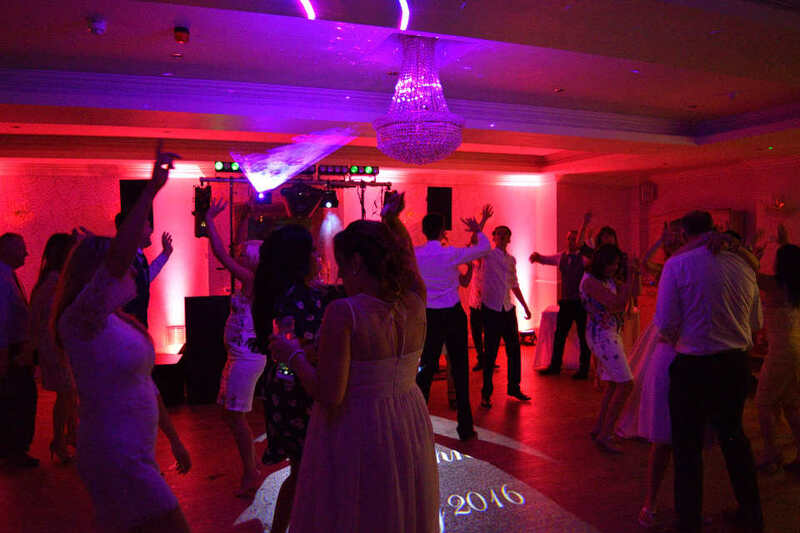 I look forward to hearing from you and I would love to DJ at your wedding at the Beaulieu Hotel. There is a lot more information about my weddings the service that I provide and how I can make your wedding special and unique on my Wedding DJ page.